Field nunber P 52A (Collector: Jörg and Brigitte Piltz) Abra de Infernillo 3000m. As: Opuntia longispina v.
Origin and Habitat: Tunilla corrugata is endemic to north western Argentina, where it can be found in the provinces of Catamarca, Jujuy, La Rioja, Mendoza, Salta, San Juan and Tucumán, but probably more widespread. Altitude range: It grows at altitudes between 1,000 and 3,800 metres above sea level. Habitat and Ecology: This cactus grows in Monte and Pre-puna habitat. This species is frequent, and the population trend is stable. No threats exist to this species. Description: Tunilla corrugata is a low, creeping succulent shrublet, more or less branched and forming compact clumps to 10 cm tall. The pads (or joints) are whitish in colour, more or less oval somewhat wrinkled. Stem-segments: Obliquely ovate, elliptic, circular, often erect, tapering at both ends, flattened but not strongly so, sometime almost cylindrical, the terminal segments often flattened, to 35(-50) mm long, 8-12(-25) mm wide, to 15 mm thick, with low tubercles, light green or pale bluish green. Areoles: Whitish, crowded. Glochids minute, yellowish. Leaves: Subulate, 2 mm, reddish. Spines: Upper ones very fine, silky, lower ones 6-8, needle-like, whitish, bent backward, 8-12 mm long, often with 1-2 much longer. Flowers: Reddish or orange-red, 6 cm long, 5 cm wide, stigma green. 1) Méndez, E., Ortega-Baes, P. & Kiesling, R. 2013. Tunilla corrugata. The IUCN Red List of Threatened Species. Version 2015.1. <www.iucnredlist.org>. Downloaded on 07 June 2015. 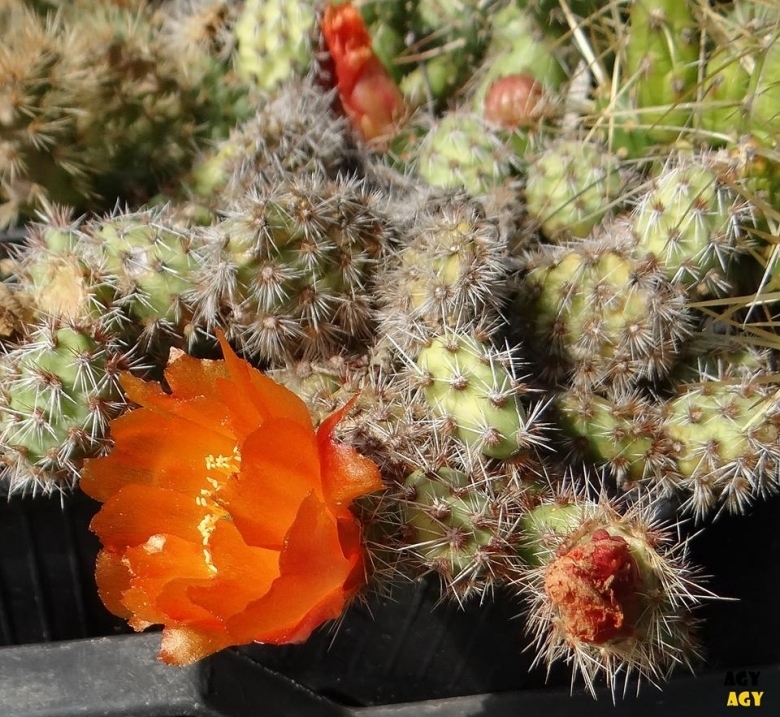 Cultivation and Propagation: Tunilla corrugata is a low maintenance groundcover plant that tolerate considerable neglect and will naturalize, it is drought-tolerant; and suitable for xeriscaping. Growing rate: It is relatively fast-growing species; in cultivation with generous irrigation it sprawls to form large low mounds in only a few years. It is suitable for hanging baskets too. Soils: Easy to cultivate outdoor in dry, sandy or gravely, well-drained soils. May be grown in clay soils as long as drainage is good and soils do not remain wet, it is very adaptable both in acid, neutral and basic (alkaline) soils, but prefers a pH in the range 6 to 7.5. Feeding: During the beautiful season it’s good to enrich the soil using a fertilizer rich in potassium and phosphorous, but poor in nitrogen, because this chemical element doesn’t help the development of succulent plants, making them too soft and full of water. Watering Needs: Outdoors little or no water once established, in the green house irrigate regularly from March to october, keep fairly dry in winter, tolerate dry condition but suffer if exposed to prolonged and severe drought. A position at the base of a south-facing wall or somewhere that can be protected from winter rain is best for this plant, but is however resistant to moisture and rain. Sun Exposure: Full sun, in semi shaded position wont produce many flowers. Frost hardiness: They are reasonably cold hardy , tolerating temperatures down to -5° to -15° C (or even less) depending on clone, they are also quite tolerant of winter wet. (In good drained soils). Pest & diseases: No serious insect or disease problems. Watch for mealy-bugs. Propagation: Propagated by cuttings of leaf pads at any time in the growing season. (Allow cut surface to callus over before planting).